Should I buy DAZ Studio 4? Thanks to a redesigned interface and the flexibility of the new Genesis figure DAZ Studio 4 is good for fast figure creation, with lots of third-party plug-ins, plus content-creation support and ZBrush interoperability in the Advanced and Pro versions. It's easy to get reasonable results, harder to get great ones, but a decent package overall. The big news with DAZ Studio 4 is the introduction of the Genesis figure. This is an androgynous mesh initially, but in the Posing/Shaping tab there’s presets for figures of both sexes, adult and child. Simply adjust the sliders to create male and female models. Items of clothing fit properly when added and scale with the figure without having to be set up. There’s less flexibility on the faces, but even here, eye size and positioning, nose length and protuberance, and mouth width can be manipulated. The interface has had an overhaul. The menu tabs are split between Loading/Creating, Posing/Shaping, Lighting/Cameras, Surfacing/Rendering and Building/Scripting. The content library is easy to use, but still shambolic, and that’s before you install any third-party products. There’s a new Auto-Fit option (Advanced version), which should help fit existing fourth-gen (Victoria/Michael) clothing items to the new model without the dreaded poke-through. There’s support for adjusting how the textures and surfaces work so skin can be made rougher or more reflective. Image layers can be added to underlying textures to create things like tattoos (Advanced/Pro). 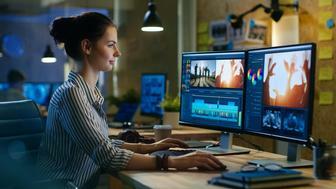 The render window shows a quality versus speed option, while the Advanced version adds progressive rendering so the bucket renderer builds up the image in multiple passes. The Pro version is expensive but includes tools for editing the figures and joints, import/export options to ZBrush and Photoshop for fine-tuning, and collecting textures for resizing into smaller formats.